Industrial-strength software with a feather-light feel. What's holding your webpage back? 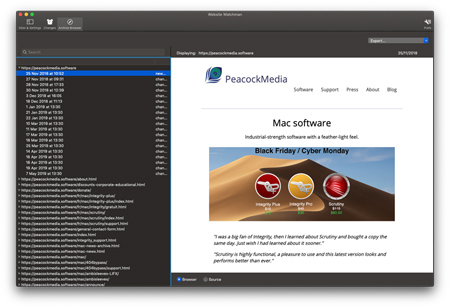 Peacockmedia have been making apps for OSX, or MacOS as we should now call it, since the early 2,000's. We're responsible for the best free link checker for mac, Integrity, and its enterprise versions, Integrity Pro and Scrutiny. Here you'll also find other useful apps and utilities such as measuring tool Meander and the album art screensaver, ScreenSleeves. Some are new, and very much in development, such as Webscraper, which can scan a website and extract data, such as the page's meta data, content (converted to plain text or markdown) or parts of the page extracted by class or id, or by regex pattern. We give top quality support and are always happy to help with problems, answer questions, hear suggestions. The first in a series of web (and therefore cross-platform) utilities. This one allows you to make http requests, set your own parameters and view the response in detail. This exciting new project can monitor a single page or a whole website and archive all changes and/or alert you to changes. Vocabagility is more than a flashcard system, it's a method. Cards are selected and shuffled, one side is shown. Give an answer, did you get it right? Move on. As quick and easy as using a pack of real cards in your pocket..
probably the most satisfying imminent release ever from NPD at PeacockMedia Towers. 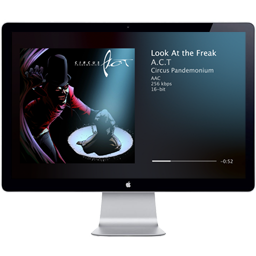 At its core, Vinyl Shine is a software pop filter developed for a better experience when listening to vinyl records. Around that is an app that can simply act as a player, or rip your vinyl and allow you to edit, split and save your tracks. This not-so-common scenario recently came to light. The enhancement to Scrutiny to trap it adds to Scrutiny's abilities to help migrate a website to secure https://. A new feature for the site. If you're as passionate about the Mac as we are, here is a list of stories, personally selected and commented upon.